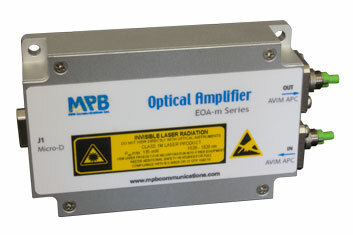 EOA-m Booster provides greater than 19 dBm of output power in a fortified housing designed to withstand harsh airborne and ground environments. Models are available at 13 dBm, 15 dBm, 17 dBm, and 19 dBm output powers. Each EOA-m Booster is designed to meet the demands of client-specific applications. Common options include input monitor, input power monitor, type of fiber, operation mode, communications interface, and fiber contector terminals. For more information on the full line of COTS or Customized EOA-m Boosters please contact MPB Communications.